Tyler Bundy ran for 109 yards and a touchdown Tuesday night. game. Scoring 30 of their 38 points in the first half, DMS Saints Head Coach, Tad Webb, effectively took his foot off the gas in the second half, playing most players on his roster. Even with the underclassmen in, DeKalb never gave up a point and managed to put 8 points of their own on the board, helping the Blue and Red cruise to victory, 38-0. 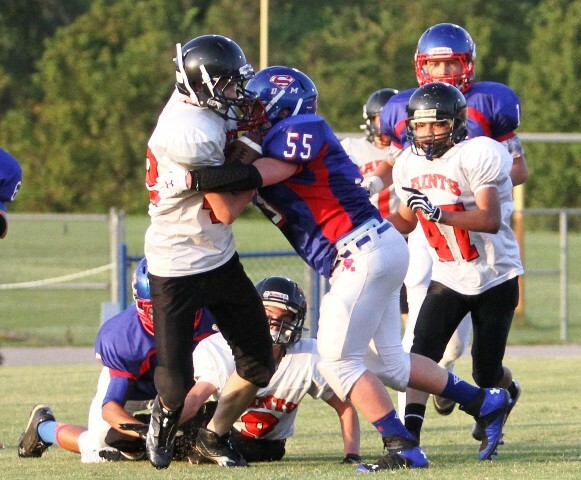 Two DMS players, Tyler Bundy and Issac Hall, rushed for over 100 yards individually in a game that saw DeKalb score early and often against a porous Southside Defense. Bundy had 109 yards and a touchdown rushing and Hall scored twice for DeKalb on a 102 yard performance. 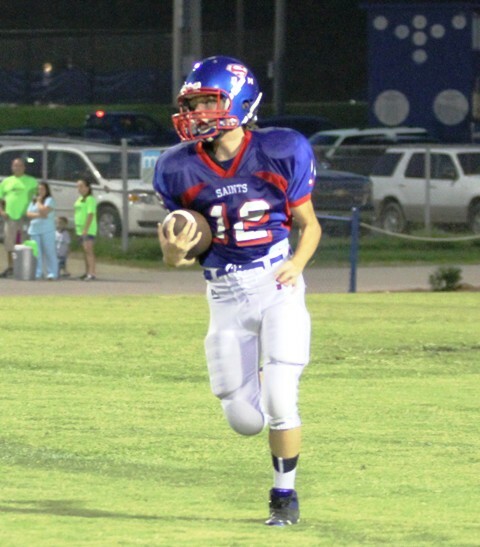 Tanner Poss was the recipient of a, quarterback Colter Norris, pass for the Saints lone passing score in the game. Defensively, Tanner Poss put the defensive side of the ball on the scoreboard, forcing a fumble and rumbling 18 yards for a touchdown. 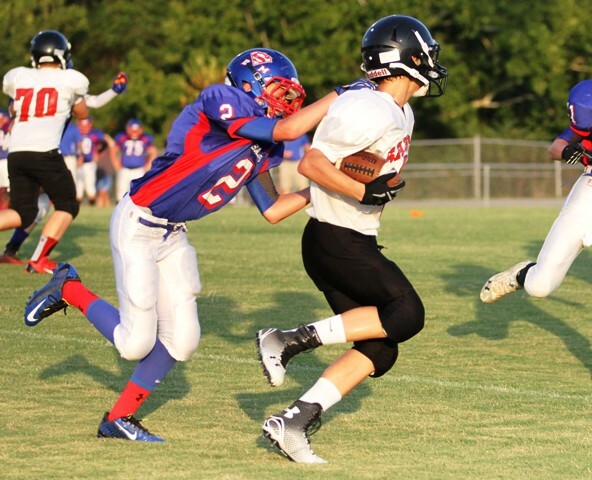 The game saw 9 different DeKalb players record tackles while forcing 3 Southside turnovers. Bundy and Hall were also standouts on the defensive side of the ball for DeKalb with Bundy leading the team in tackles with 6 and getting a fumble recovery. Hall had a tackle and an interception in the contest. Late in the game, Joshua Carlton picked off a Southside pass, effectively ending the game. 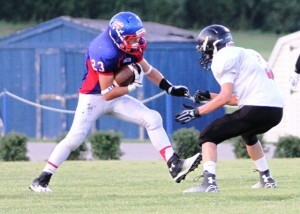 Tanner Poss caught a touchdown and scored off of an interception Tuesday night. Statistically for the game, Colter Norris was 1 of 3 for 2 yards, a touchdown and 2 conversions for DeKalb, while Conner Vaughn threw twice for 15 yards. Tanner Poss caught a touchdown and Joshua Carlton caught a pass good for 15 yards. After Bundy and Hall, Josh Carlton had 36 yards rushing for DeKalb, while Luke Bryant added 22 and Colter Norris rushed for 10. Noah Martin ran for 9 yards in the contest, Tanner Poss ran for 4 yards and Conner Vaughn added 3 yards. 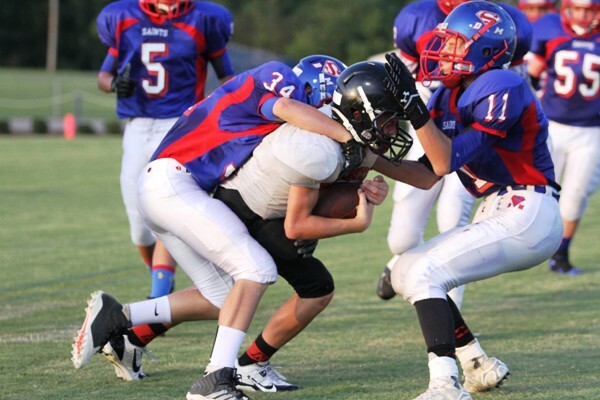 Defensively, Juwain Smith had 3 tackles for DMS and three Saints, Cedric Cruz, Hunter Fann and Noah Martin each had two. Dylan Denson, Nathan Adkins, Issac Hall, Tanner Poss, Grayson Redmon, Issac Walker and Miguel Quintero each recorded 1 tackle in the contest. The Saints will come home Thursday when DeKalb will face Cannon County at 6:30. Below are additional images of Tuesday night’s action. 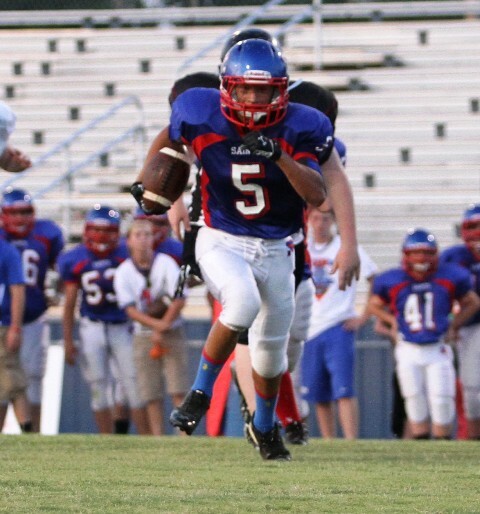 Noah Martin played well on both sides of the ball Tuesday night. 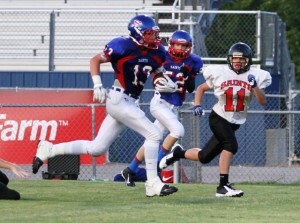 Luke Bryant chasing down a Southside player Tuesday night. 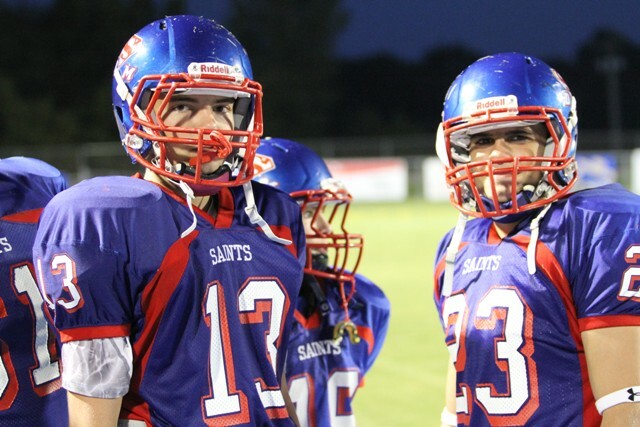 Juwain Smith had three tackles and handled the kicking duties for the Saints Tuesday night. Issac Hall was outstanding for DeKalb Tuesday evening. 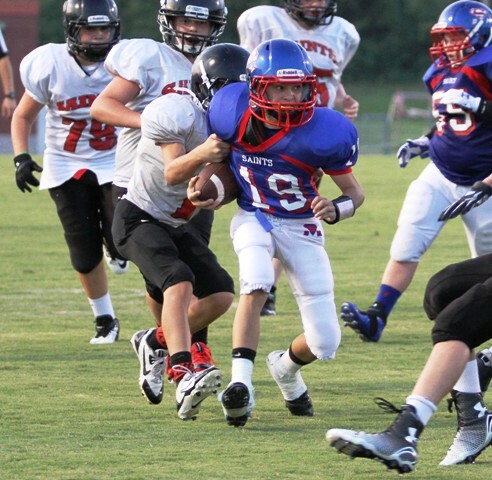 Big Hunter Fann roared for the Saints defensively Tuesday night. 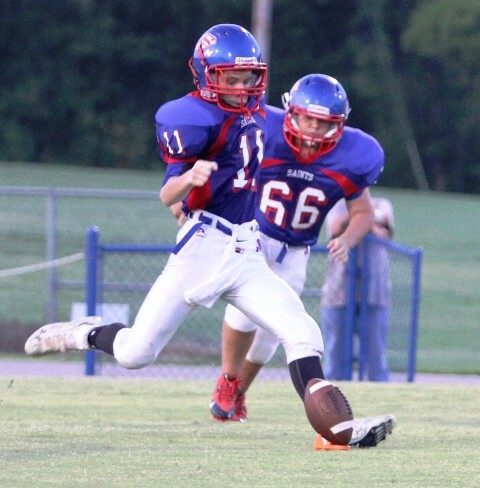 Colter Norris led the Saints to a 38-0 win over Southside Tuesday night. 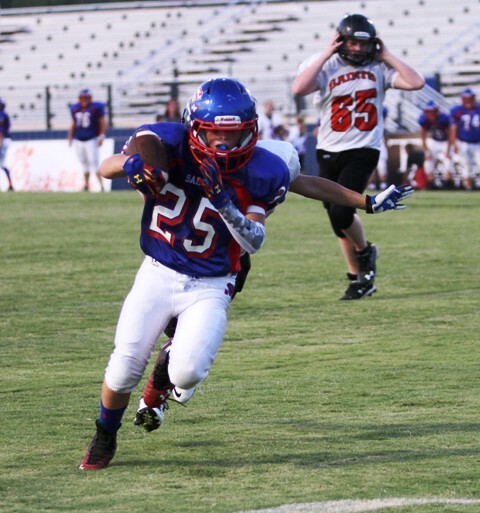 Joshua Carlton got an interception against Southside Tuesday evening. Tanner Poss and Tyler Bundy.